A series of experts:Lucky Star RSI,Lucky Star RSI and MACD, Lucky Star WPR, Lucky Star MA, Lucky Star SO, Lucky Star MACD, Lucky Star MA and SO, Lucky Star MA and MACD , Lucky Star SO and MACD the probability of winning real money in management or bonuses to real accounts (read more on this in my blog). 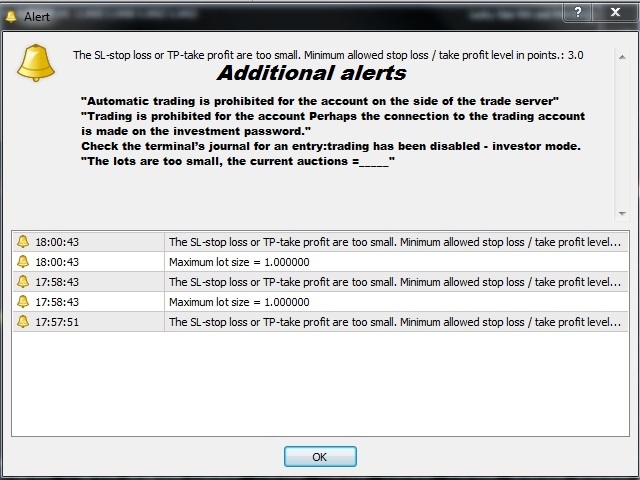 EA can be configured under the many rules of various contests of various brokers, if the trading of robots is of course allowed.The whole series of advisors Lucky Star have the ability to determine the permission to trade robots and immediately alert you using the alert system Alert (a separate window will pop up with a sound alert, see screenshot) in the MT4 terminal.Alert will also warn you about an error, if you accidentally logged into the account under the investment password. The adviser will also determine the type of account (real, demo or competitive account, see screenshot) and inform you about this in the upper left corner of the terminal window of the currency pair on which you have installed EA. EA can trade around the clock until you stop it.Orders are set according to the signals of the RSI indicators (the signals can be turned on both in parallel and together, that is, in the first case, any first signal opens orders, in the second case, orders open only when both signals give an opening signal), closing orders occurs by action Stop Loss, Take Profit or TrailingStop.Take Profit, Stop Loss, TrailingStop and lot value -Lot,you choose yourself or set according to the rules of competitions (see blog).In the EA interface (see screenshot), you can carefully adjust the RSI indicators using various methods of averaging, closing or opening bars (the number of bars for averaging), etc. using the MT4 strategy tester and your broker's trading history. The screenshots show the approximate capabilities of the adviser. Instructions for configuring advisor Lucky Star RSI. EA work signals here or in profile.